Located by Nam Song Lake at Payuhakiri District, Country Lake Nature offers rooms with tranquil terraces and garden views. Guests can dine under the stars at the ambient outdoor restaurant. Rooms at the Country Lake Lodge have simple and modern furnishings. Each room comes with cable TV, air conditioning and a sitting area. For exploring the natural scenery and local area, Lodge Country Lake Nature offers a bike and canoe rental services. 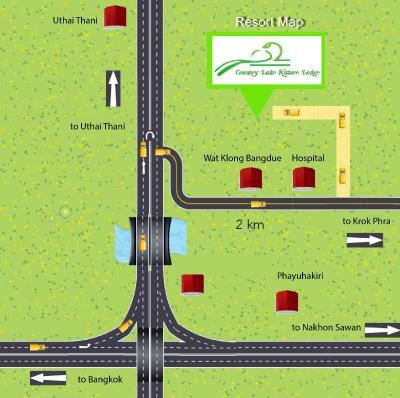 Relaxing massages are also available, and Thai cooking classes are offered by the hotel. This peaceful and tranquil lodge is located 137 miles from Bangkok in the western jungle of Kanchanaburi. When would you like to stay at Country Lake Nature Lodge? House Rules Country Lake Nature Lodge takes special requests – add in the next step! Country Lake Nature Lodge accepts these cards and reserves the right to temporarily hold an amount prior to arrival. Please inform Country Lake Nature Lodge of your expected arrival time in advance. You can use the Special Requests box when booking, or contact the property directly using the contact details in your confirmation. We need at least 5 reviews before we can calculate a review score. If you book and review your stay, you can help Country Lake Nature Lodge meet this goal.